Metropolitan Lawrence Huculak, joined parishioners, family and friends in celebrating Fr. 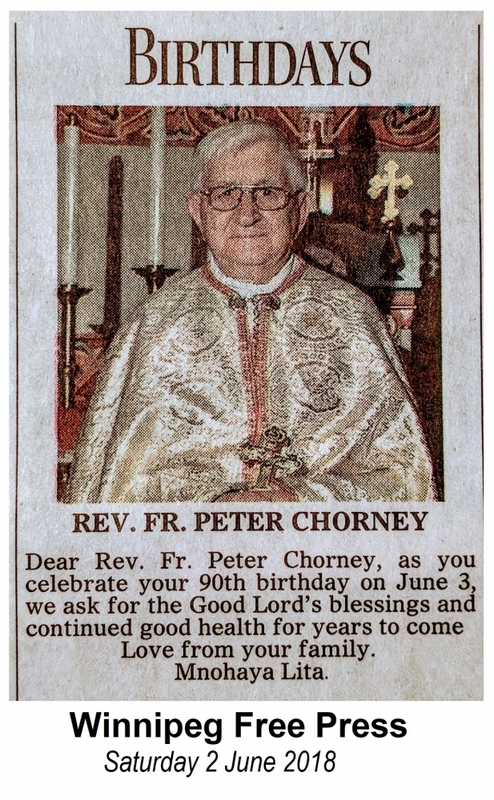 Peter Chorney's 90th Birthday at his parish in Selkirk on Sunday, 3 June 2018. Father Peter was ordained to the Priesthood during the annual Cooks Creek Dormition Pilgrimage by the late Metropolitan Michael Bzdel, C.Ss.R. in 2001. At the ceremony, three other candidates were also ordained priests - Frs. Nestor Yakiwchuk (deceased), Emil Kardasinec (Neepawa) and Michael Krochak (retired). They had all attended seminary together as later vocations at a period then affectionately known as the "year of the grumpy old men". Happy and fun-loving, they were anything but grumpy, but some witty seminarian, remembering a popular movie by the same name, mentioned it and it stuck. Fr Chorney, the youngest of eight children, was born in Saskatchewan. He married his wife Jeanette on his birthday in 1950 and they had three children. He was always involved with the parishes that he attended. He participated in the Archeparchial Diaconate program was ordained deacon on 28 December 1986 by the late auxiliary Bishop Myron Daciuk, OSBM at Sts. Peter & Paul church in St. Boniface. 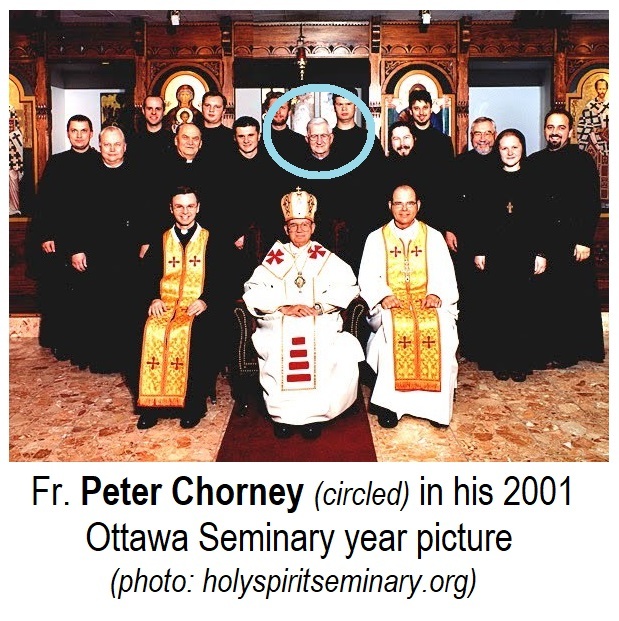 Fr Peter Chorney together with the other above-mentioned deacons, travelled to Ottawa where he completed a program of seminary training and achieved his certificate in Eastern Theological studies through the Sheptytsky Institute at St. Paul University. He has had a few pastoral appointments since ordination - including Lac du bonnet, Frazerwood and Gimli and the general Interlake Area. Since 2007, he has been serving the Selkirk area, where, according to the website of the Ukrainian Catholic Churches of the Selkirk Region, Fr. Peter continues to hold regular services in the parishes of Selkirk (Holy Eucharist), East Selkirk (Blessed Virgin Mary) and Gonor (Holy Trinity).